Does The Bible Really Condone Stoning People To Death? 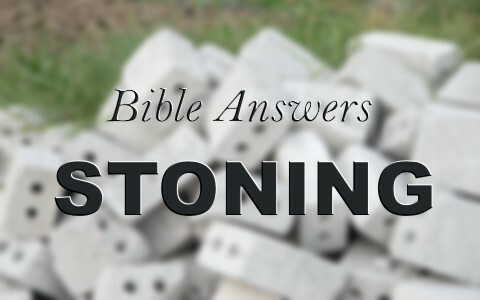 The Bible speaks of stoning people to death? Why? Does the Bible condone this? People who are both believers and non-believers struggle with the stoning of sinners in the Bible. For one thing, it was not a grey area stoning but something that had to be a very serious offense. God taught capital punishment but only for the most serious of offenses. Stoning is still being done, even today in parts of the world, by the Muslims but no longer by Jews. It was never done by Christians though. When someone was stoned, the person who was the accuser had to cast the first stone, which is why Jesus said that whoever is without sin should cast the first stone (John 8:7). The stones were not as most people might think they were but where huge stones, sometimes the size of a cinder block and often death could come quickly but sometimes took an hour or more. Stoning continued until the victim was either killed or became unresponsive. The Apostle Paul once survived a stoning (Acts 14:19; 2 Cor 11:25). Stoning was never done for something that wasn’t a very serious or grievous sin and only then there had to be at least two or more witnesses to testify that the crime actually happened and these witnesses were required to cast the first stones. It there was only one witness, no one could be stoned at all. Stephen the deacon was the first martyr of the Christian faith. Stephen had just given a sterling, historical account how Jesus was the exact fulfillment of the long-prophesied Messiah (Acts 7:1-53) in one of the greatest expository messages that has ever possibly been given and it was indisputable. Even so, “when they heard these things they were enraged, and they ground their teeth at him” (Acts 7:54). They were angry because deep inside their hearts they knew Stephen was right. Then “they cast him out of the city and stoned him. And the witnesses laid down their garments at the feet of a young man named Saul” (Acts 7:58) and like Jesus did at the cross, Stephen prayed that God would not hold this sin against them (Acts 7:6). Saul was present and in fact, consented to Stephen’s stoning and this may well have been when Saul’s conscience was first touched that there might have been something more to Jesus Christ and those who believed in Him than he might have originally believed. Perhaps the seed was planted for Saul’s conversion at that time of Stephen’s stoning while seeing the forgiveness of Stephen while he was being brutally stoned to death. One day, early in the morning, the scribes and the Pharisees brought a woman who was caught in the act of adultery to Jesus and told Him what they had caught her in the act of doing (John 8:1-5). One question I would ask is where was the man? Why wasn’t he also brought before Jesus? Isn’t this a bit of hypocrisy or prejudice to only bring the woman and not the man? Wasn’t the man due the same form of treatment that the woman was? Of course he was. Perhaps the man was one of their own kind; a religious leader and they didn’t want to bring one of their own before Jesus. These men were not really interested in justice but in trying to trap Jesus. If Jesus said yes she should be stoned, they’d go to the Roman authorities and tell them that Jesus is trying to break Roman law and teaching that they should kill someone which the Roman’s didn’t permit the Jews to do. And if Jesus said no to the stoning, they would accuse Him of breaking the Mosaic Law and then report Him to the Jewish Sanhedrin to possibly be put on trial. Jesus does something very clever here…as He always did when people were trying to trap Him…He turned the tables and told them “Let him who is without sin among you be the first to throw a stone at her” (John 8:7) at which the oldest left first (having more sin acquired in their lifetime) ending with the youngest. Jesus doesn’t excuse this woman’s adultery thought because He said to her “from now on sin no more” (John 8:11c). Why Stoning, is the Sin Really That Serious? Why would God teach the Jews to take such drastic measures in capital punishment such as stoning? Does God really condone stoning people to death? No, not really. Stoning was intended for children who struck their parents (Ex 21:15) but the age of the child is never given and in these cases it was likely only done to grown or nearly grown children because the Hebrew word for son is “ben” and never refers to a young child. Yes, by today’s standards it seems harsh but wasn’t the reality of the Greeks (who were said to invent crucifixion) and the Roman’s methods were far worse when they crucified people and their death often took several hours. The fact that this punishment was so severe acted to arbitrarily cause the nation to be strictly obedient. It says that children weren’t allowed to strike their parents but the word used for strike is not a slap, hitting, or a punching but is from the Hebrew word “nakah” and means to beat, slay, scourge or kill so the punishment of stoning was for something very serious for when a child beat, killed or scourged a parent so it had to be taken very seriously to prevent such a thing from becoming widespread throughout society. Adultery and other crimes were also punishable by stoning. God believed in capital punishment because it was a powerful deterrent to criminal activity spreading throughout the land and becoming the norm for the nation. If left unchecked, the whole society would come unraveled and it would be unsafe for anyone to live in such a state. To look back at the Mosaic Laws and to ask why God allowed certain things is to make ourselves the judge of God and I won’t go there. These seem harsh to our thinking but in a society where there were no civil police forces that patrolled the nation of Israel, God had to institute His laws as a device to check or prohibit crime from ever happening. The severe punishment of stoning was instituted for this nation to deter crime and was intended to prevent it from becoming rampant and keep the entire nation from self-destructing or imploding upon itself. If we don’t understand something in the Bible or what God taught, we must simply trust the Creator Who has every right to govern in the way that is best to Him for who can question God. I can’t. Here is another good Bible question: Does the Bible Say About Slavery? Of course we can question Him! Name a Biblical character who didn’t. Jacob even wrestled with Him! To stop thinking about the problem just at the point you cease to understand it does not advance faith or understanding. Previous post: What Does Abomination Mean When Used In The Bible?